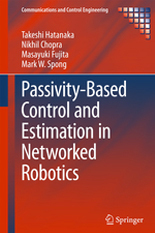 Department of Mechanical Engineering Associate Professor Nikhil Chopra recently co-authored a book Passivity-Based Control and Estimation in Networked Robotics. Springer International Publishing will publish the book in May. Chopra worked on the book with co-authors Masayuki Fujita, Professor with the Department of Mechanical and Control Engineering at Tokyo Institute of Technology, Mark W. Spong, Dean of the Erik Jonsson School of Engineering and Computer Science at the University of Texas at Dallas, and Takeshi Hatanaka, Associate Professor with the Department of Mechanical and Control Engineering at Tokyo Institute of Technology. According to the publisher's description, the book highlights the control of networked robotic systems, and synthesizes a unified passivity-based approach to an emerging cross-disciplinary subject. The books unified approach enables readers to access various state-of-the-art research fields by studying only the background foundations associated with passivity. In addition to theoretical results and techniques, Chopra and his co-authors provide their readers with experimental case studies on test beds of robotic systems including networked haptic devices, visual robotic systems, robotic network systems and visual sensor network systems. Chopra is an affiliate in the University of Maryland's Institute for Systems Research and focuses his research on developing a fundamental understanding of control of networked dynamical systems. His work is motivated by applications in networked control of robotic systems and semi-autonomous telerobotic networks. He received his Bachelor of Technology degree in Mechanical Engineering from the Indian Institute of Technology from Kharagpur, India and his Ph.D. in Systems and Entrepreneurial Engineering from the University of Illinois of Urbana-Champaign. For more information on Associate Professor Nikhil Chopra, please visit his faculty webpage.